Around the country, and especially in certain hipster-ish social circles, sobriety is getting rebranded. Ruby Warrington, author of the popular new book Sober Curious, hosts an alcohol-free event series in New York City called Club SÖDA NYC. Daybreaker’s early morning no-booze dance parties now happen in 25 cities around the world. Online, self-styled sobriety coaches including Holly Whitaker of Hip Sobriety and Annie Grace of This Naked Mind offer multi-week programs to help their followers go alcohol-free. Hello Sunday Morning, which calls itself the world’s “largest online movement for alcohol behaviour change,” now boasts 110,000 members. Interest in more informal sobriety experiments — Dry January, Sober October, One Year No Beer — has reached a new peak, with Google Trends reporting that the number of searches for “Dry January” in January 2019 was nearly double what it was two years ago. “I think there are more and more people who are saying, ‘Hold on, I’m concerned about my drinking and I would love a way to work on that where I don’t have to explain it all to people,’” says Jessica Lahey, author of The Gift of Failure and a forthcoming book on addiction in kids. 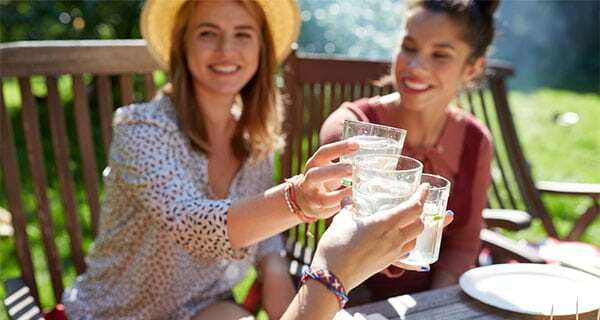 “Concerned about my drinking” isn’t always code for “alcoholic.” Some 63% of U.S. adults still drink, reports a recent Gallup Poll, a figure that has remained relatively steady over the last two decades. Yet a much smaller percentage have what experts call “alcohol use disorder,” with the latest figures varying between 6.2% and 14% of the population. So, many folks not drinking don’t see themselves as addicted — they’re abstaining for other reasons. And a cottage industry of sobriety gurus has arrived with books, workshops and online courses on offer. Is this just wellness culture in overdrive? Or is the US starting to change its relationship with booze? For the most part, alcohol addiction experts welcome the sobriety experiment trend. “It can rarely hurt to take a break from anything you do habitually, just to see,” says Lisa DuBreuil, a social worker with a focus on addiction and eating disorder patients at Massachusetts General Hospital in Boston. Sharon Wilsnack, PhD, a professor of psychiatry at the University of North Dakota who studies substance abuse in women, supports sobriety experiments because they let people assess their relationship with drinking without needing to seek expensive or difficult-to-access treatment. She advises journaling during the month to track your response to sobriety. “If you can be in a situation where you’d regularly drink and maybe you have a fleeting feeling of discomfort, but then you get a soda and it’s not that big a deal, then you probably don’t have a problem,” she says. Moderate or low-risk drinking is defined as no more than three drinks in a single day or seven per week for women, and no more than four drinks per day or 14 per week for men, according to the National Institute on Alcohol Abuse and Alcoholism. Sixty-four percent of people keep their drinking to that level, according to the most recent data. “We’re finding a lot of unhealthy patterning buried within that ‘moderate-drinking’ group,” says Timothy Naimi, MD, who studies the health impacts of alcohol as a professor at the Boston University Schools of Medicine and Public Health. Scientists don’t have a good way to predict who in that “moderate with occasional bingeing” group will develop a full-blown addiction. There is evidence that genetics and biology interplay with environmental factors like socioeconomic status to make some people more prone to alcohol abuse than others. But there is also strong evidence that most of the people who drink that way will not ratchet up to the level of the 13% of Americans who are considered high-risk drinkers, let alone those who meet criteria for an addiction diagnosis. “There is such a thing as occasional, pleasurable, no-big-deal, not-dependent, just-enjoys-it drinkers,” says Wilsnack. On the other hand, she says, you can’t know for sure that you’re in that camp unless you try sobriety and find you can handle it. Wilsnack also notes that some studies on a “controlled drinking” treatment model suggest that even among problem drinkers, there is a minority who may do just as well, if not better, with a moderation approach to alcohol rather than true sobriety. Those moderate drinkers who are not at risk for addiction may benefit from a sobriety experiment in other ways: “The negative changes in mood and functionality that can come with alcohol arrive incrementally,” DuBreuil says. “It’s like a tide coming in; you don’t notice it until your beach towel is already wet. And sometimes it isn’t until you take that complete break from alcohol that you’re able to see its impact.”…..